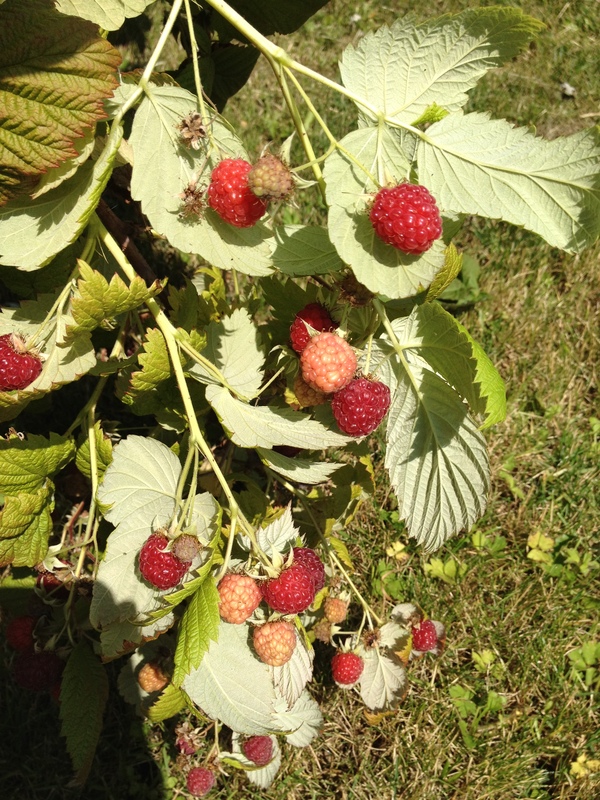 Continuation of raspberry madness here. It is finally summer in the Lower Mainland, and there have been some fairly hot sunny days sprinkled in here and there. 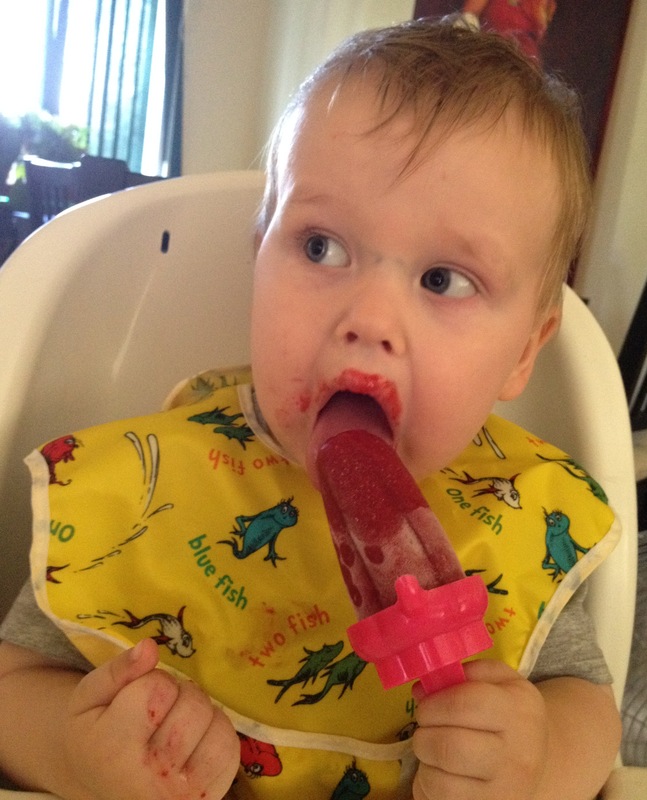 So, popsicles (or poc’les as my favourite little lady Memphis likes to call them) were in order. 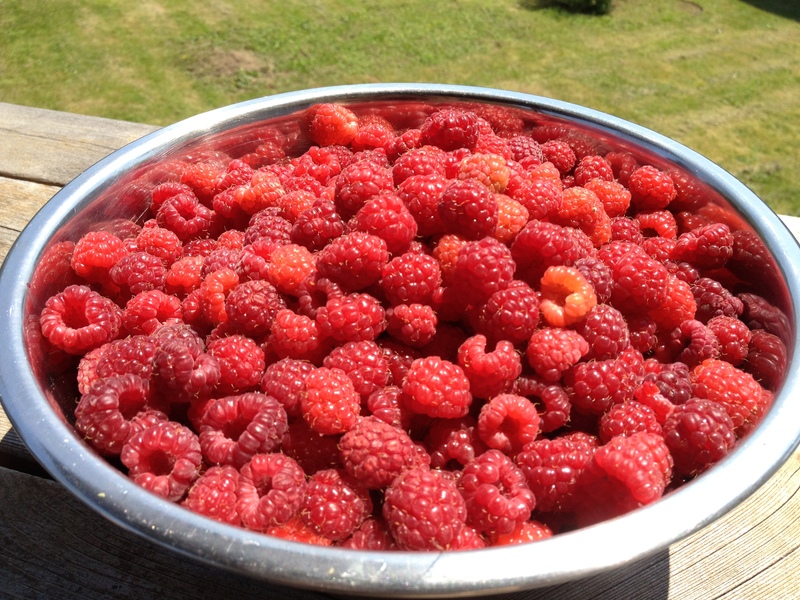 As mentioned in the previous post, I have an abundance of raspberries from the backyard on hand and decided to add in some BC cherries while they were still readily available. 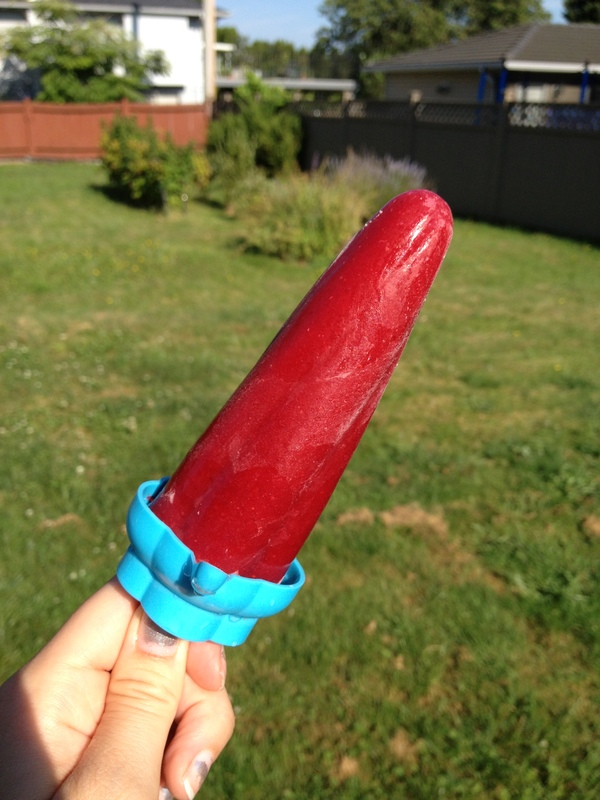 I have made a few versions of popsicles so far this summer, but these ones have been my favourite so far as I like a nice tart pop in flavour. These were also Ryker approved as he finished his own and part of mine as well. 2. Strain seeds out. 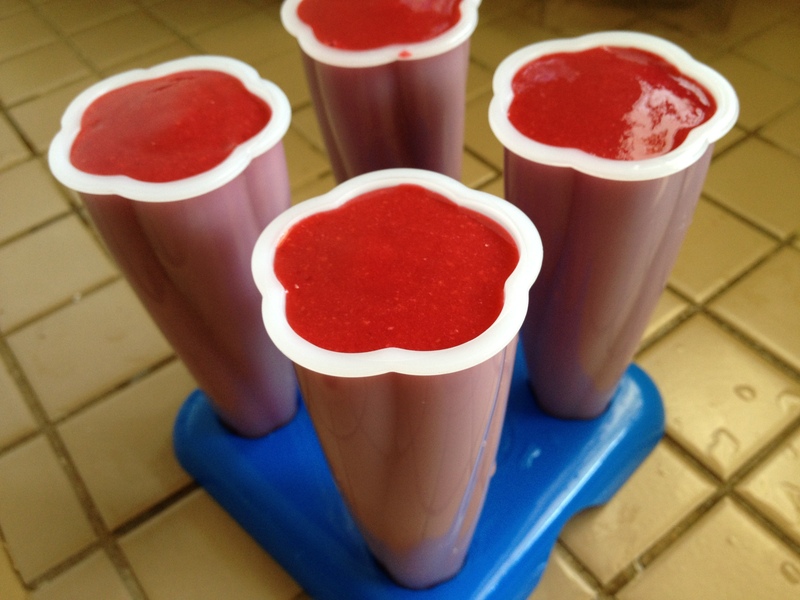 Pour into popsicle containers. 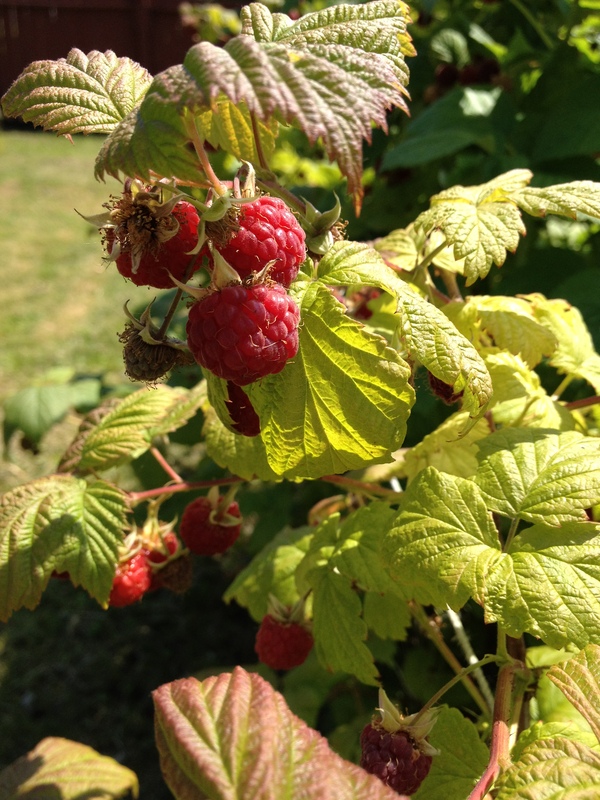 Ok folks, you are about to get bombarded with some raspberry concoctions, as our raspberry bushes received an abundance of rain during the spring and are quite plentiful. There are a few versions of these out there (I believe Smitten Kitten being the originator), and after tasting mine I’m pretty sure all versions are probably quite delicious. 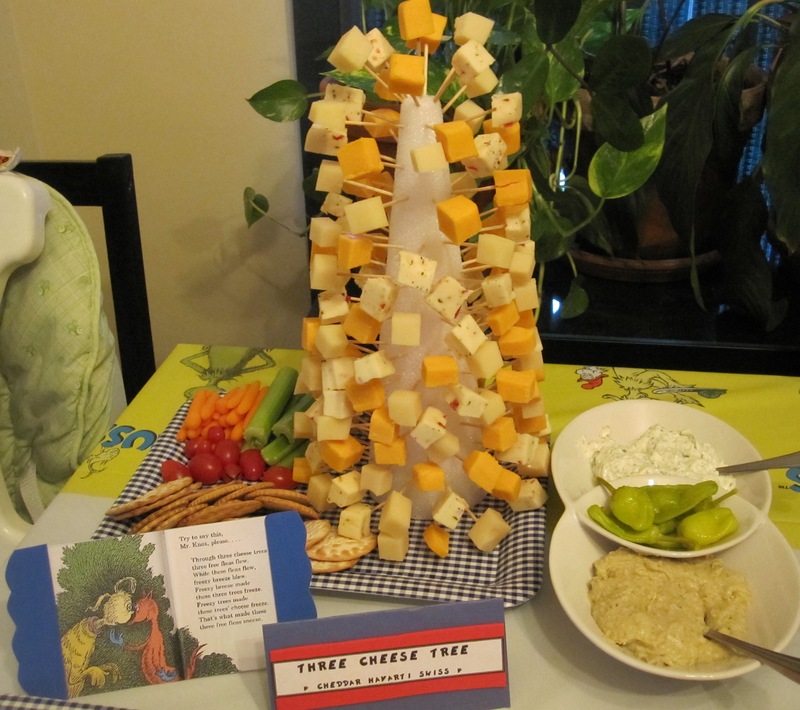 Ideally, you want the outsides to have a slight crisp to them and a lovely chewy middle. 2. 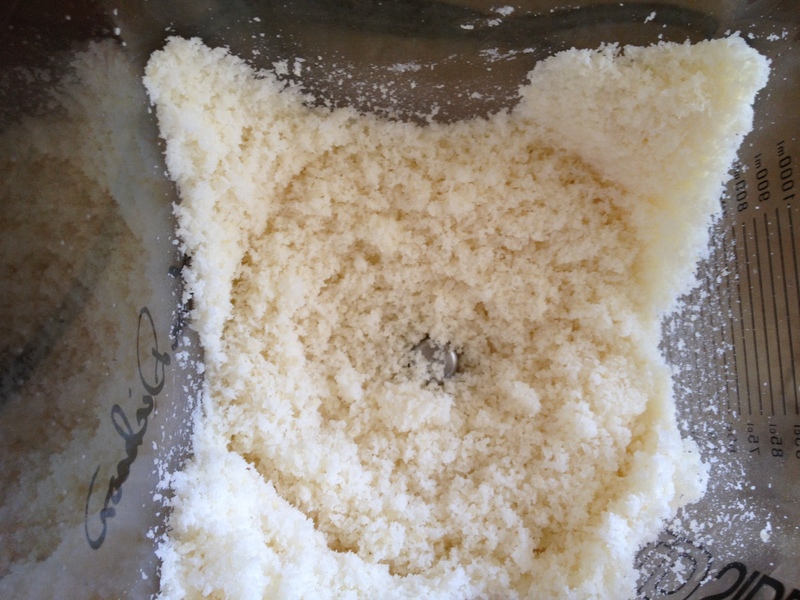 Food process coconut until it is crumbly. Add egg, vanilla, sugar & salt. 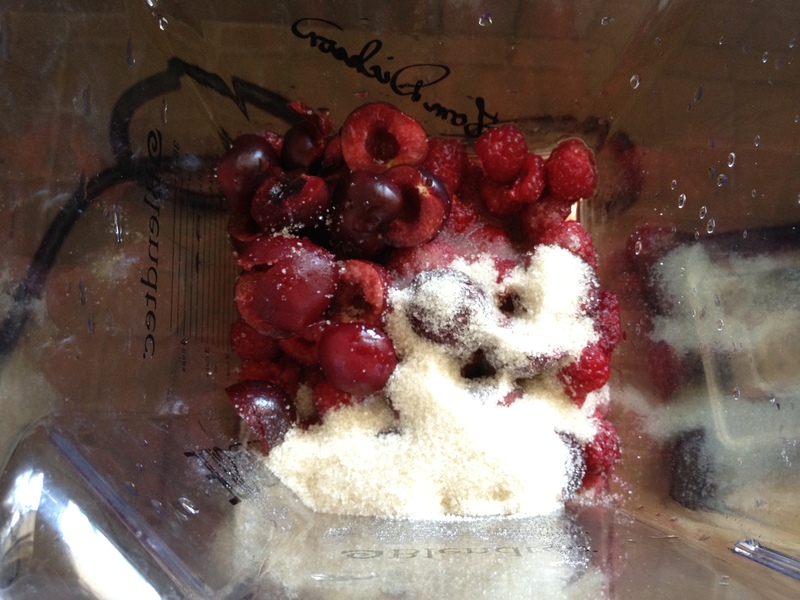 Then pulse in the raspberries (if you desire a marble effect, leave raspberries in chunks). 3. Place 1 tbsp scoops onto a baking sheet lined with parchment paper. Bake about 25 mins. 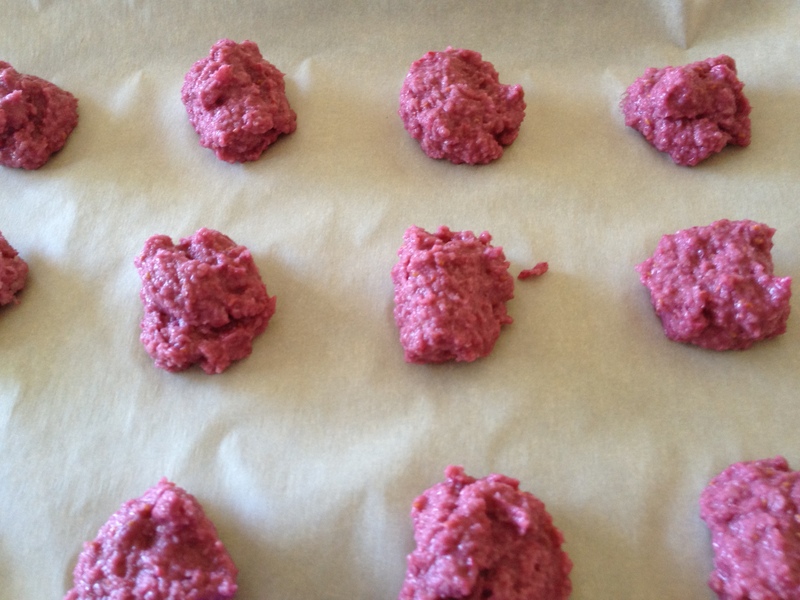 Remove from oven and let them sit for about 10 mins before transferring to a wire rack. Store in a cool place. Alright folks, it has been quite sometime since I have done a post on this page! 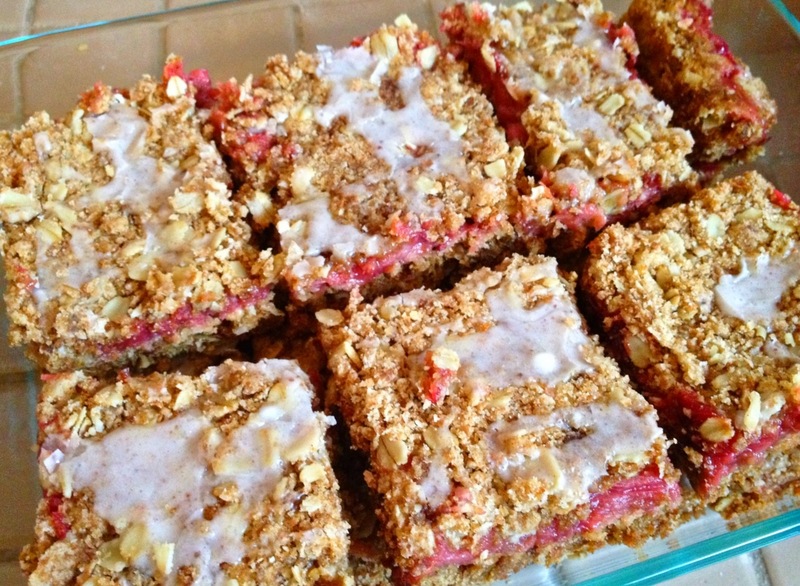 But, I recently made some super delicious bars that inspired me to get back in the swing of things here. I have also been busy on my other page The Mane Squeeze, which is focused more on hair, fashion, beauty and all of that good stuff. Anyways, the Rhubarb in my backyard was almost on the brink of going past its prime but I caught it in time with a reminder from Richard. I’ve never actually cooked or baked with Rhubarb before, but my mom always did as we had some in my backyard growing up as well. 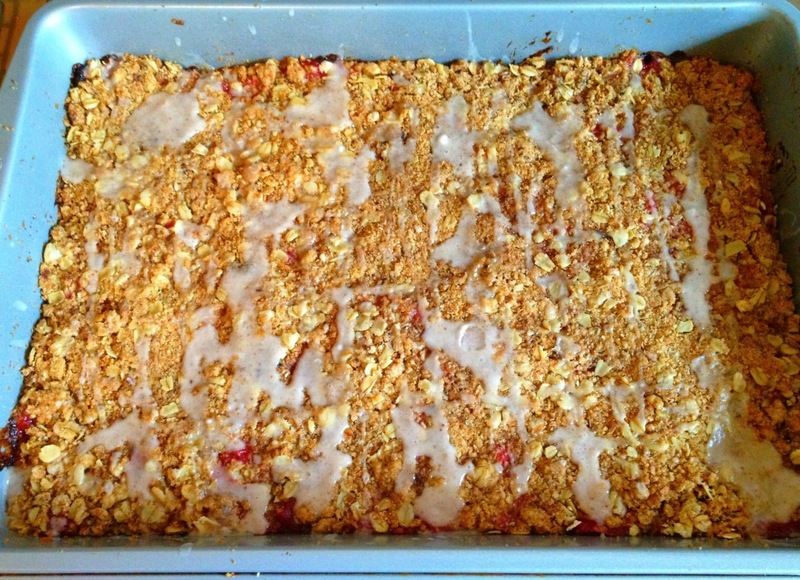 I decided to mix it up with some strawberries (not from the backyard, but still local :)) and try out some crumb bars topped with a cinnamon and nutmeg glaze. All I can say is yum! I had to send the majority with Richard to work out of fear of eating them all. 1. Preheat oven to 350ºF. 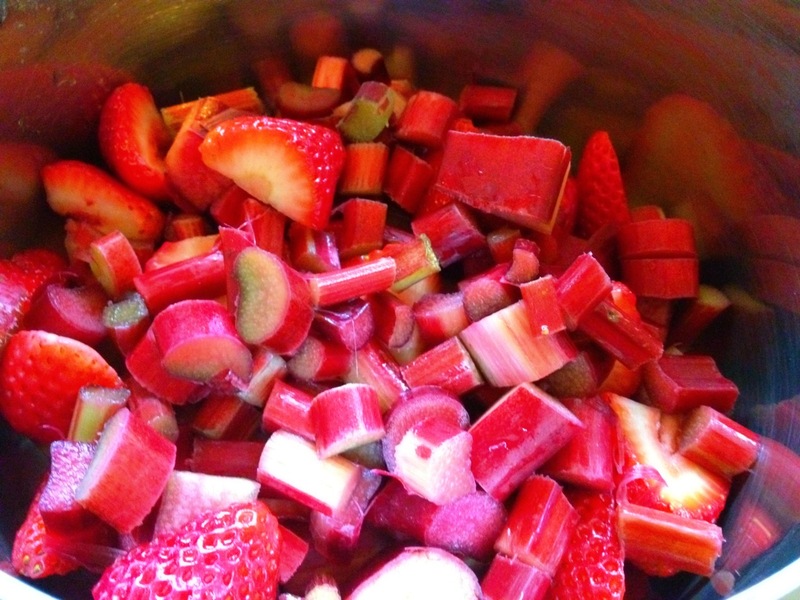 In a saucepan combine rhubarb, strawberries and lemon juice. Cover and cook over medium heat until tender, stirring occasionally. 2. Combine the white sugar and cornstarch, and stir into fruit mixture. Cook until mixture comes to a boil and mixture thickens, stirring constantly. Remove from heat, and set aside. 3. Combine all of the crust ingredients in a bowl, except for the egg. 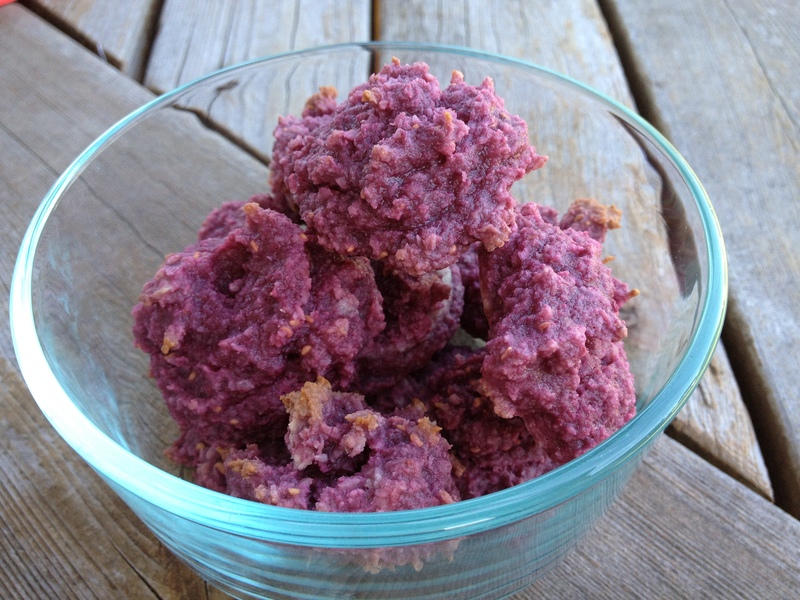 Beat at a low speed until mixture becomes crumbly. Reserve 1½ cups of crust mixture, set aside. Beat in 1 egg into the remainder of the crumb mixture. 4. Line bottom of a 9×13 greased pan with the egg crumb mixture. 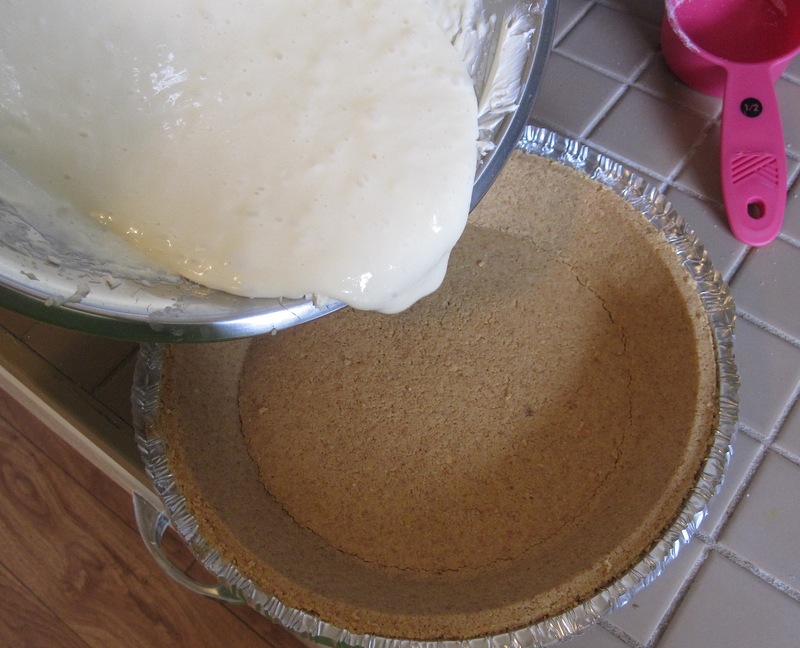 Then spread the filling evenly across the crust. Then sprinkle the reserved crumb mixture. 5. Bake for 30-35 mins or until golden brown. Let the bars cool completely. 6. Combine all of the glaze ingredients in a bowl and drizzle over the bars. Enjoy! Today, my little man turned 1 year old! I just can’t believe that a whole year has gone by, it all happens so very fast. 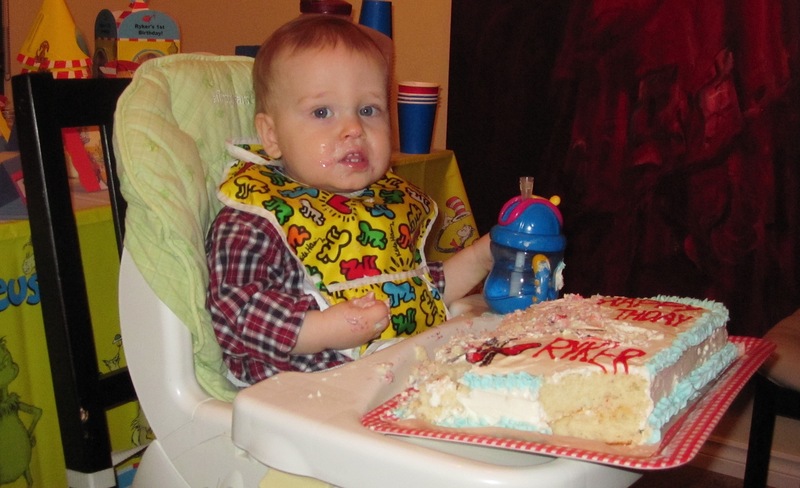 Ryker is my everything, so I wanted to make his first birthday very special. 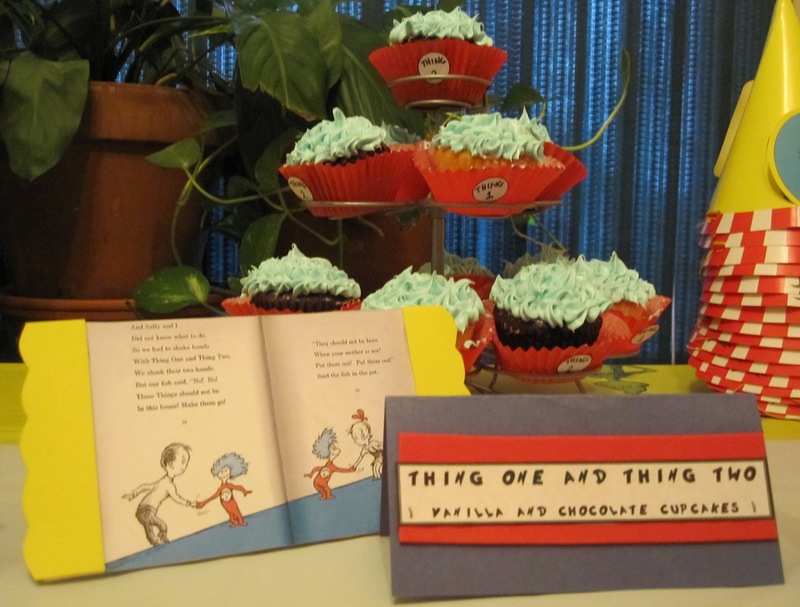 We love Dr.Seuss, so that is the theme that I decided to run with. 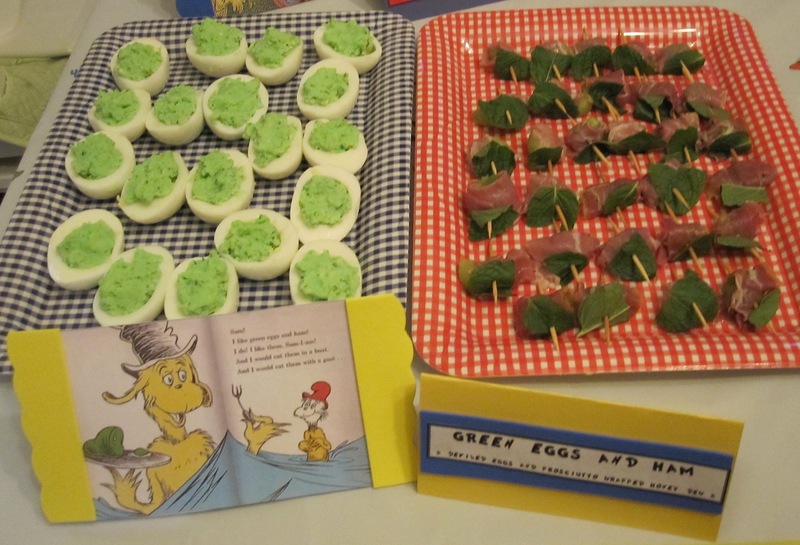 I made sure that all the food was Dr.Seuss themed, and I pulled different types of food from his books and made my interpretation of them. 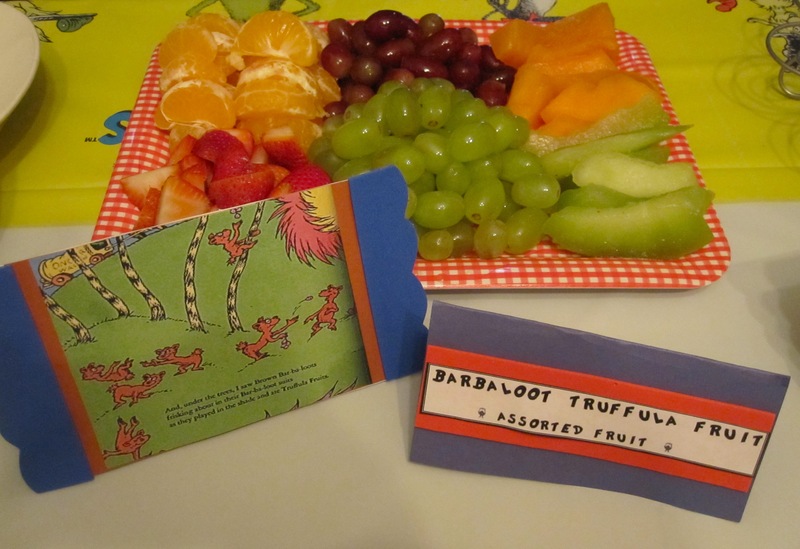 To add some nice little details I made label cards and copied pages from the books of where the inspiration for the food came from. Anyways, enough with the chatting. I’m just going to post all the pics below of how everything turned out. 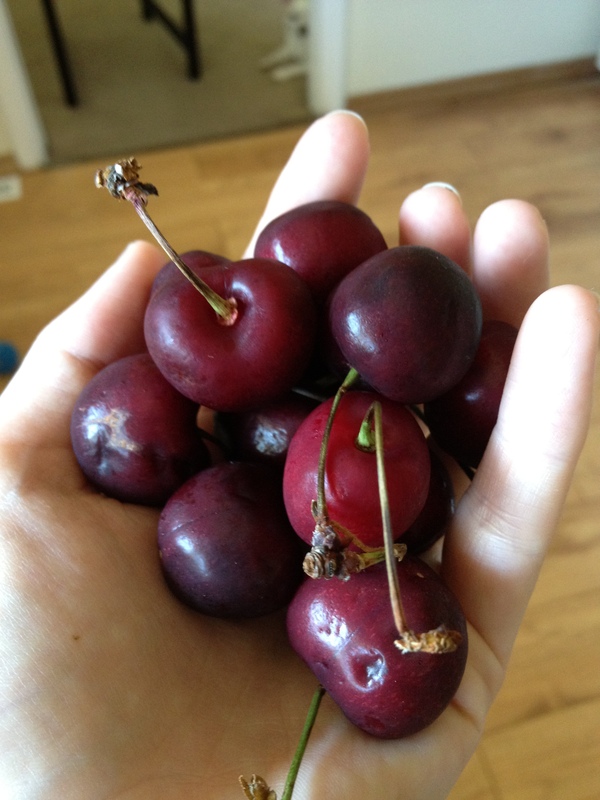 I’m not putting any recipes up on this post as it would make it insanely long, but if you have any questions at all about recipes, how I made things etc., please don’t hesitate to ask in the comments or leave me your e-mail and the requested recipe and I would be more than happy to share anything with you. 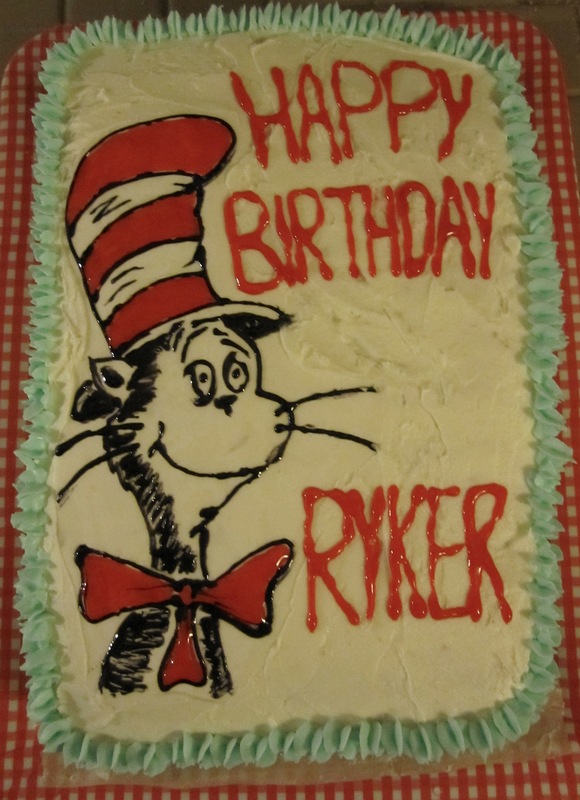 Ryker’s Cat in the Hat Cake! It was my first attempt at decorating something properly ever. 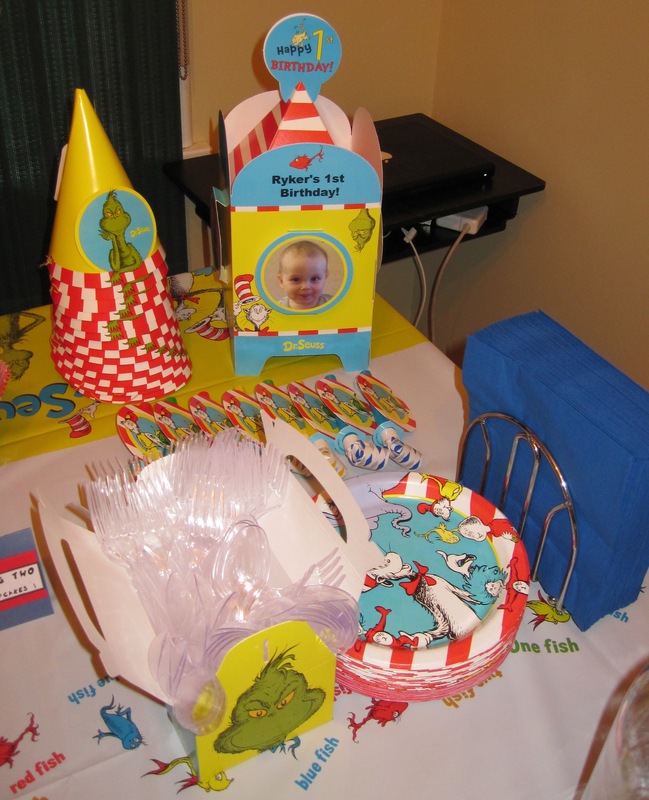 Happy Birthday little man! I love you with all of my heart! 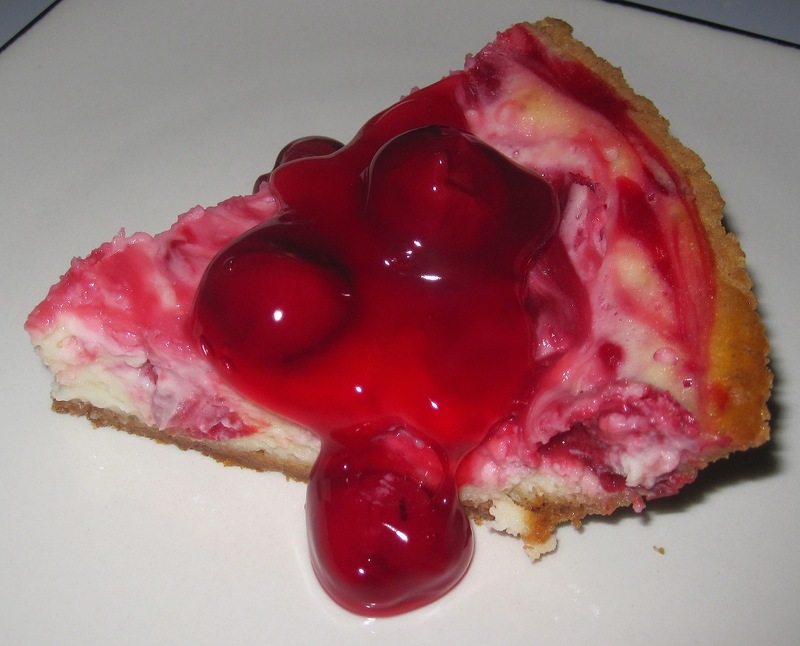 Ok, so this Cherry Swirl Cheesecake recipe isn’t completely from scratch, but it is enough from scratch that it is still homemade. 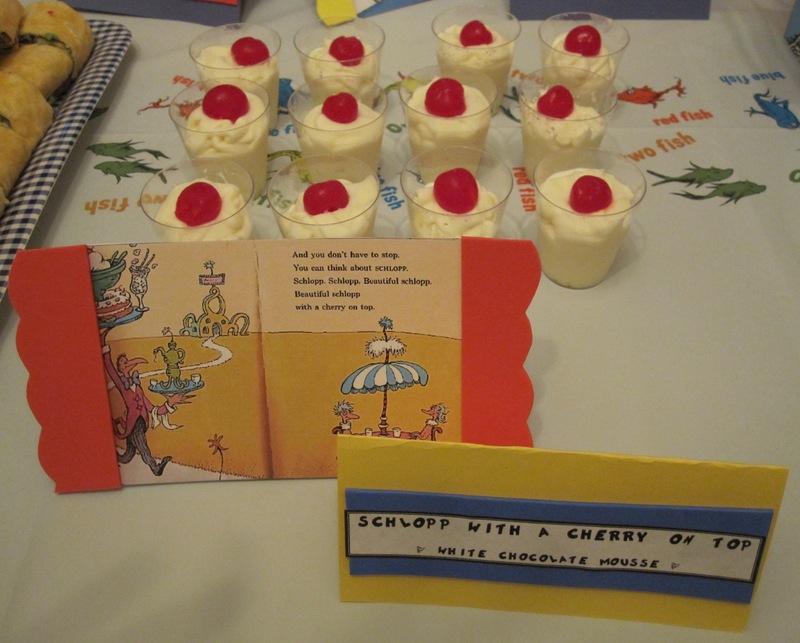 I was making a huge meal and was in search of a dessert that I could make the day before and that was easy to execute due to time constraints. So to cut down on some time, I used a Keebler Ready Made graham pie crust and I used a canned cherry pie filling. It turned out great and you can substitute in any flavour of pie filling that you please. 1. Preheat oven to 325º. Using an electric hand mixer, beat cream cheese on medium speed until it is fluffy. Beat in sugar and vanilla. Beat the eggs 1 at a time until just combined. 2. Spread cream cheese mixture in crust. 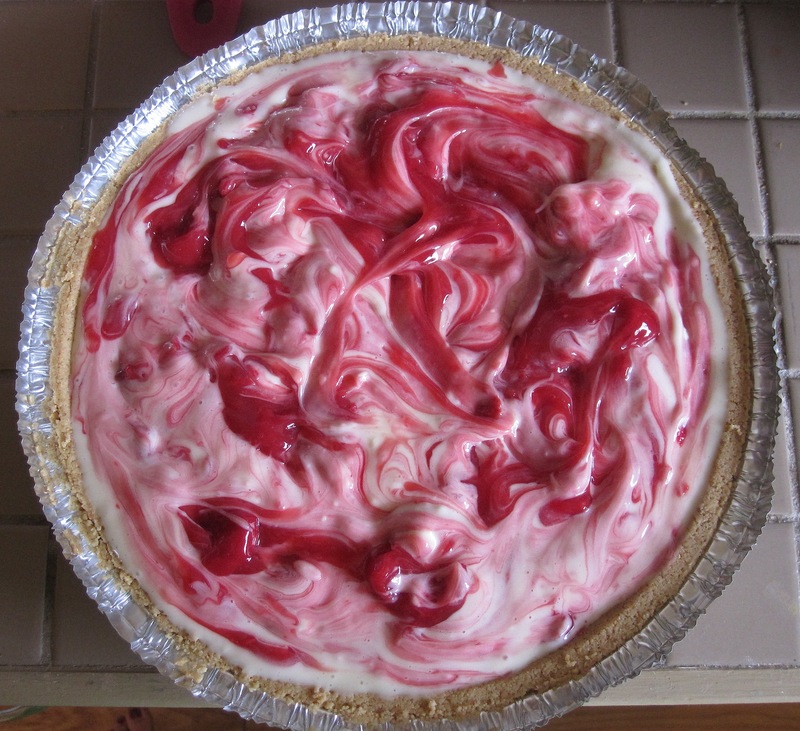 Using 2/3’s of the cherry pie filling, spoon it in dollops on top and use a knife to swirl pie filling into the cream cheese. 3. Bake for 30-45 mins or until center is almost set (give the side a tap and it should move together in one solid movement). 4. Cool on wire rack for 1 hour and then in the fridge for at least 3 hours. 5. Top with the remaining pie filling and serve. Alright….I’m back. Have been fairly busy lately and quite frankly by the end of my day, I haven’t found the energy to sit down and get some posts done. Kudos to those of you that manage to keep this up! Lately, by the end of the day, the only thing I find myself doing is watching some really bad tv. 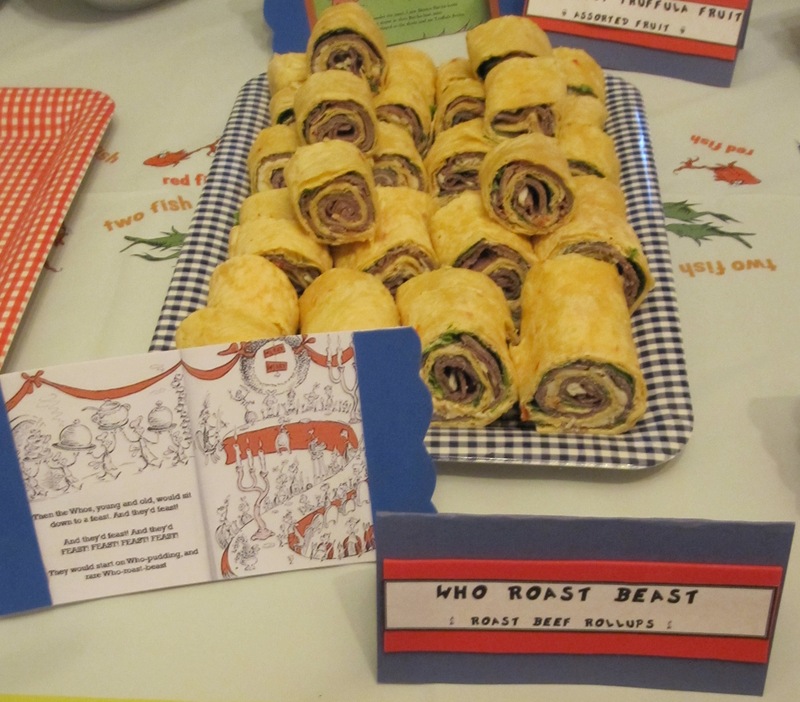 I will stop that nonsense, and get on top of this as I have many recipes ready to be posted. 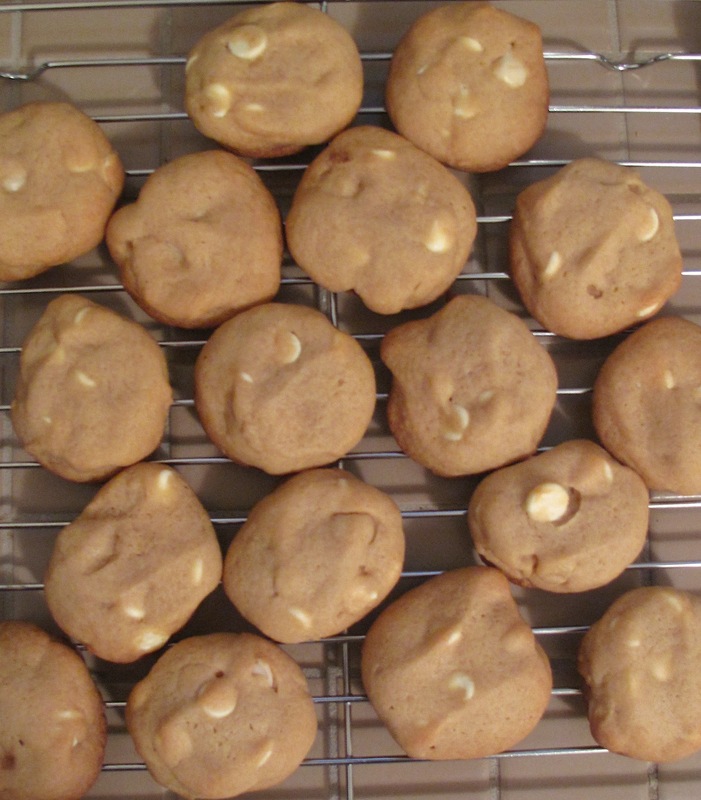 So today, we have White Chocolate Macadamia Nut Cookies! 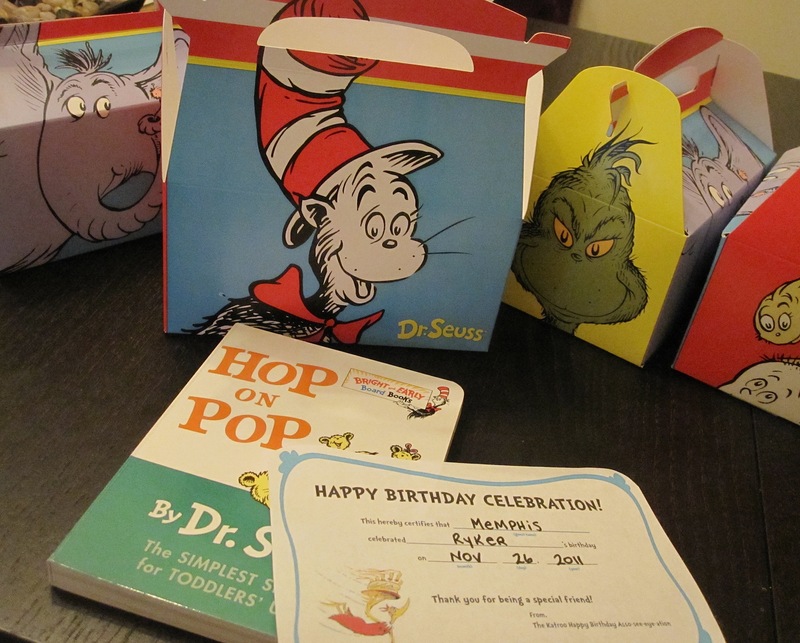 While in the process of making these, I realized that my oven was not heating up. This was of course not only happening when I was in the middle of making cookie dough but also prepping a lasagna for dinner, yeesh. 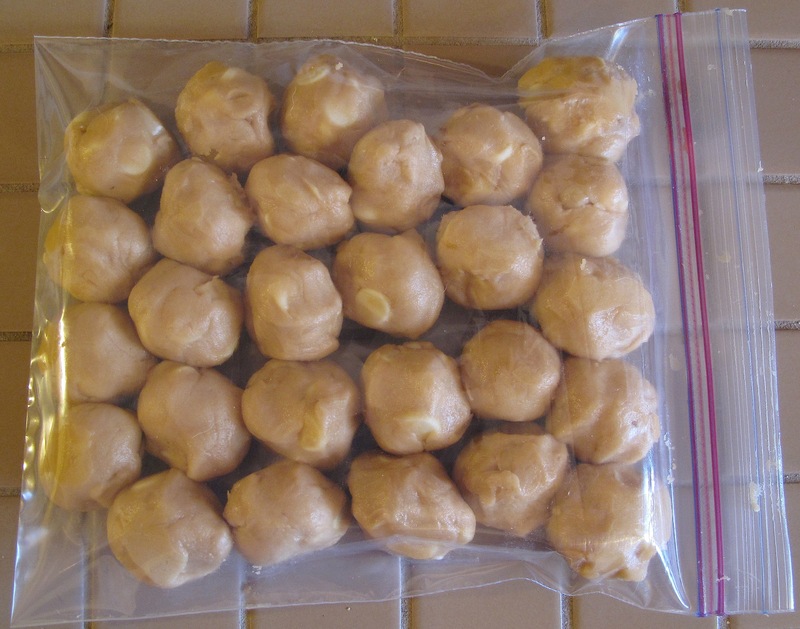 So what I did was rolled them up into balls and popped them into a ziploc freezer bag (as pictured below) for a couple of days while we figured out what happened. They stored great and I just plopped the frozen suckers down on the cookie sheet and put them in the once again working oven with an extra couple minutes tacked on. Enjoy! 1. Preheat oven to 350°. Cream butter and brown sugar together. Beat in the eggs 1 at a time and add vanilla. 2. Mix flour, cornstarch, salt and baking soda together and add to the wet mixture. Stir in the white chocolate chips and macadamia nuts. 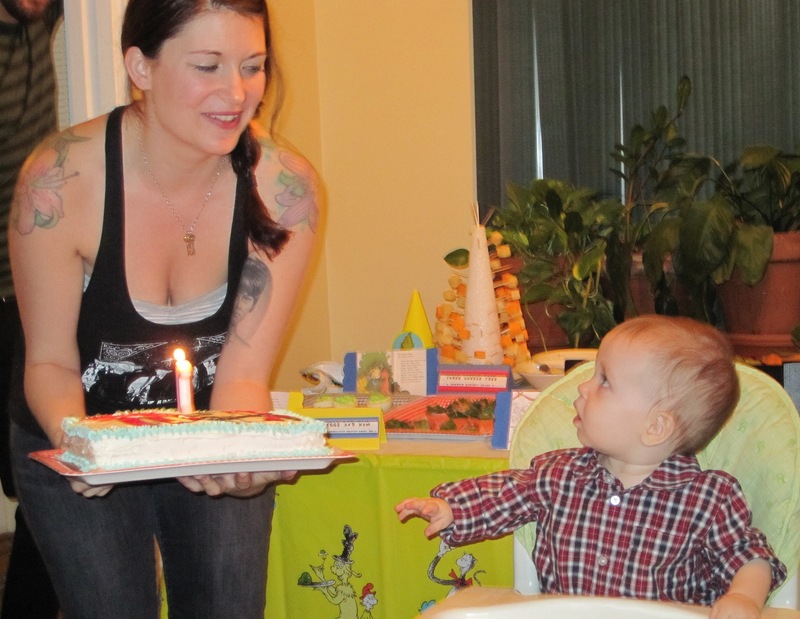 I have a few loves in life, my son, my boyfriend, my dogs and carrot cake. Seriously though, Carrot Cake would be at the top of the list as a part of my last meal…along with waffles, lasagna, poutine and a variety of other things that would put me into a food coma. 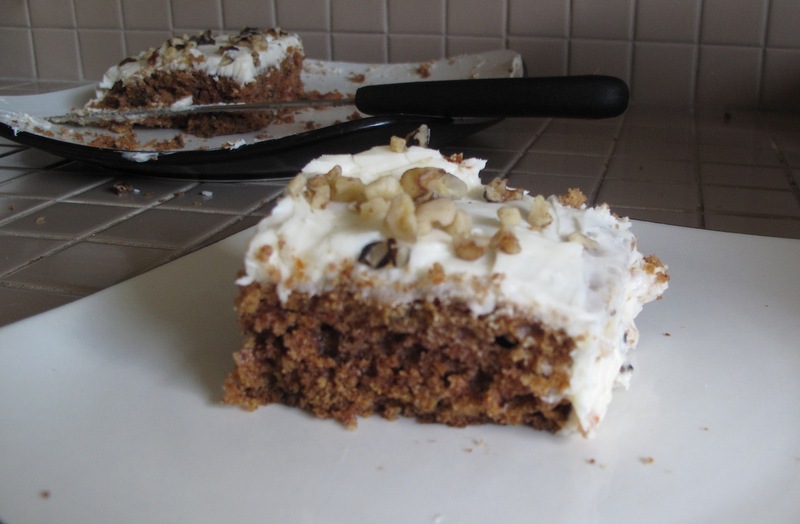 Although I have tried carrot cake from pretty much anywhere I could get my hands on it, I had never attempted to make it before….until now :). Although I appreciate when carrot cake gets all “fancy”, I prefer a nice simple one with a good cream cheese icing which is what the recipe below gives. I have also decreased the amount of sugar that usually resides in the cream cheese icing, because I feel it takes away from the richness that cream cheese has to offer. Enjoy! 1. Preheat oven to 350°. In mixing bowl combine sugar and oil. Beat in eggs one at a time and and vanilla. 2. In another bowl mix flour, baking soda, baking powder, salt, cinnamon and nutmeg. 3. Combine wet and dry ingredients. Stir in grated carrot and ¾ cups walnut pieces. Be careful not to overmix, just stir till everything is coated. 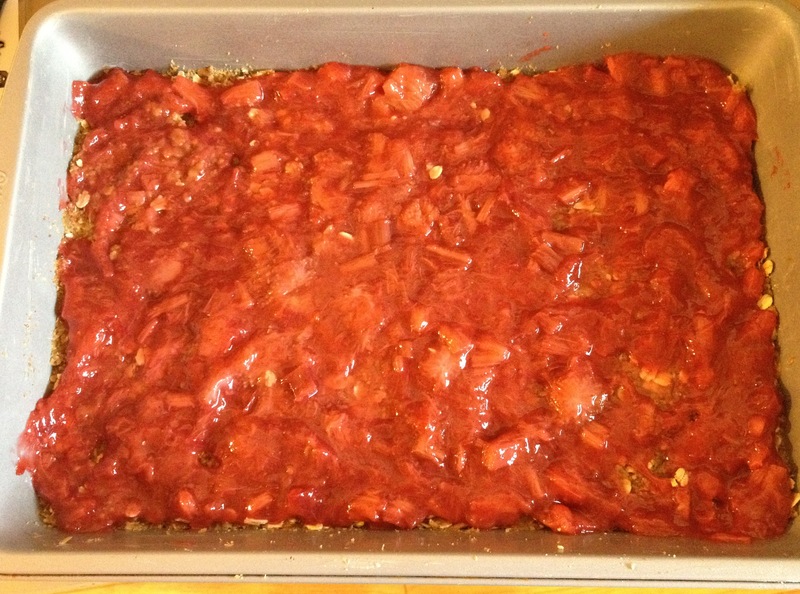 Pour mixture in a 9×13 pan and bake for 35 minutes or until toothpick comes out clean. Cool cake on a wire rack. 4. For icing: Beat cream cheese, butter and vanilla together using an electric hand mixer. Gradually beat in icing sugar and beat till fluffy. 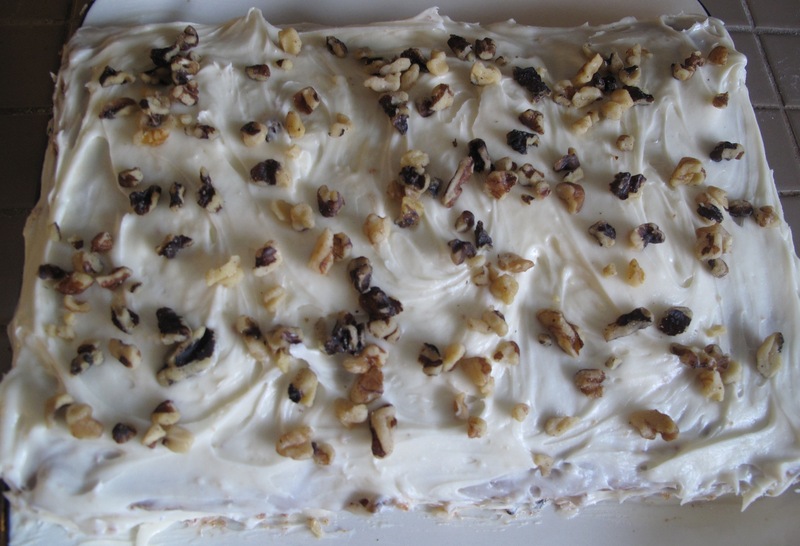 Spread onto a cooled cake and sprinkle ¼ cup walnut pieces over top. I am a 30 year old mother of 1 baby boy. 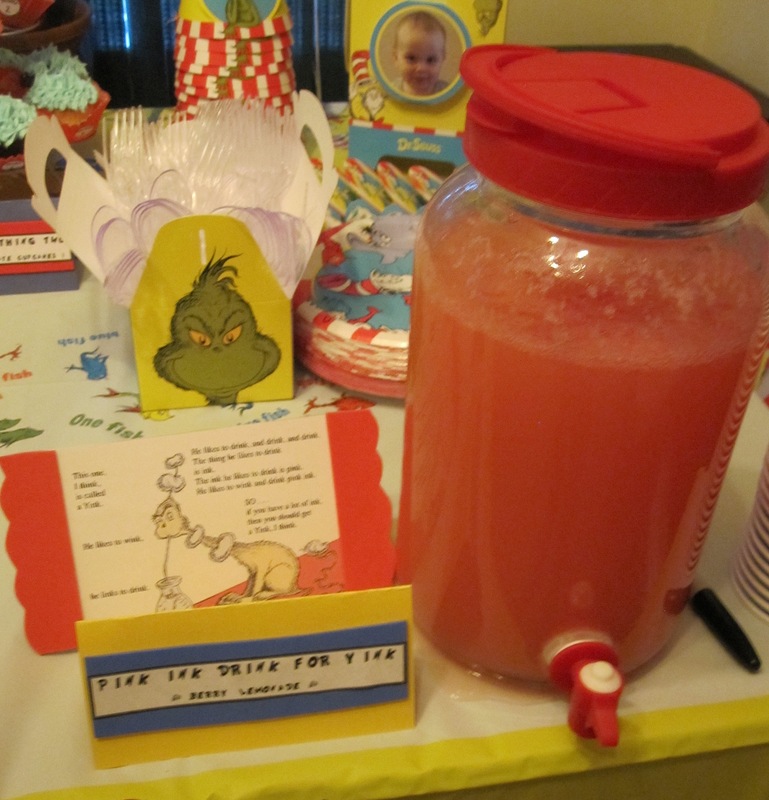 These are my adventures in cooking and motherhood.